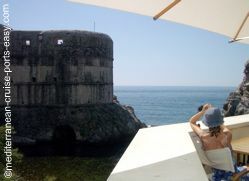 "Dubrovnik Photo Gallery - Dubrovnik pictures of Dubrovnik souvenirs, Old Town attractions and more..."
1. Sponza palace and the clock tower, viewed from the St. Blaise church. 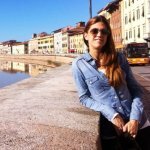 This is one of the most vibrant parts of the Stradun street and a perfect spot to sit down at one of the patios and enjoy your coffee! 2. 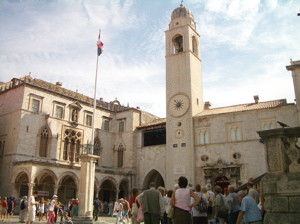 Small Onofrio’s fountain and the square leading to the Cathedral and the Farmer’s market on the Gundulic square. 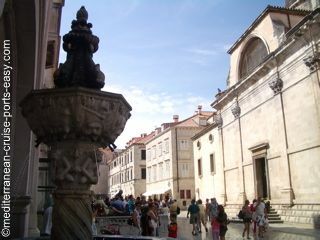 Today Onofrio’s fountain is a natural setting for plays written centuries ago and played at Dubrovnik summer festival. 3. A lady in local outfit, showcasing and selling some hand made artefacts. You can always see her sitting at the same spot on the way to the Ploce gates. It's also good to know that some souvenir stores also sell ladies' traditional attires. That way you can buy beautiful white ladies' blouses with hand embroidered borders and wear them back home! 4. 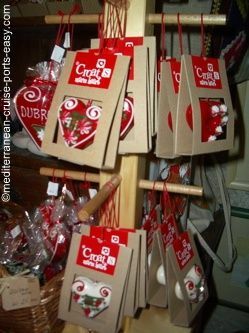 Gingerbread hearts - maybe not a typical Dubrovnik souvenir but still a cute gift to take home from Croatia. In the past they used to be made for eating but we don’t recommend eating these! 6. Ploce gate complex, the exit/entrance to the town on the other side from the Pile gate, which is where your buses or tours will drop you off. Carry on walking a bit further out of these gates and walls to get a perfect picture of the Old Harbour. 7. 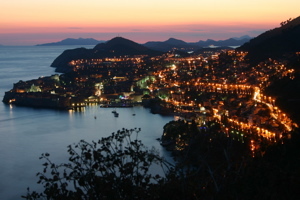 Dubrovnik by night - as your cruise ship most likely leaves Dubrovnik before the sunset, we decided add this photo of Dubrovnik by night to our Dubrovnik photo gallery. 8. 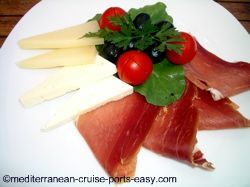 Dubrovnik dining - locally made Prosciutto, cheese, olives and tomatoes sweeter than any you have ever tried before is just a nice introduction to your Dubrovnik lunch. 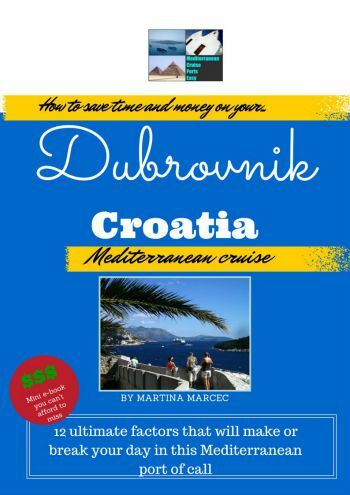 Food is one of Croatian attractions just as much as its natural beauties and old architecture. Enjoy! 9. 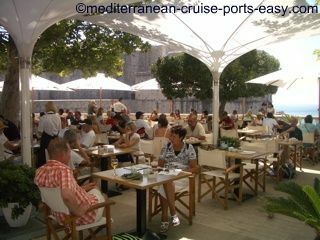 The Pile gate area is the last point cars and buses can reach on the way to the Dubrovnik Old Town which explains why it’s so busy and popular with tourists and cruise guests alike. 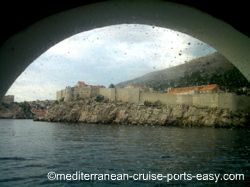 This will also be your first touch with the monumental Dubrovnik walls. If you’re not in a rush, sit and have a coffee or breakfast on one of the terraces facing them. 10. 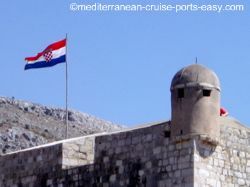 Croatian flag with its recognizable red and white checkerboard field on the Dubrovnik walls is an must for our Dubrovnik photo gallery. Getting one of the football tops with the checkerboard design is a must if you have a teenager or a football fan in your family! You will see many of those in the souvenir shops of Stradun. 12. Fort Bokar, built to protect the entrance to the Pile gate. You can enjoy the best view from the terraces around the Pile area. A very dramatic and unique setting for a breakfast or lunch. 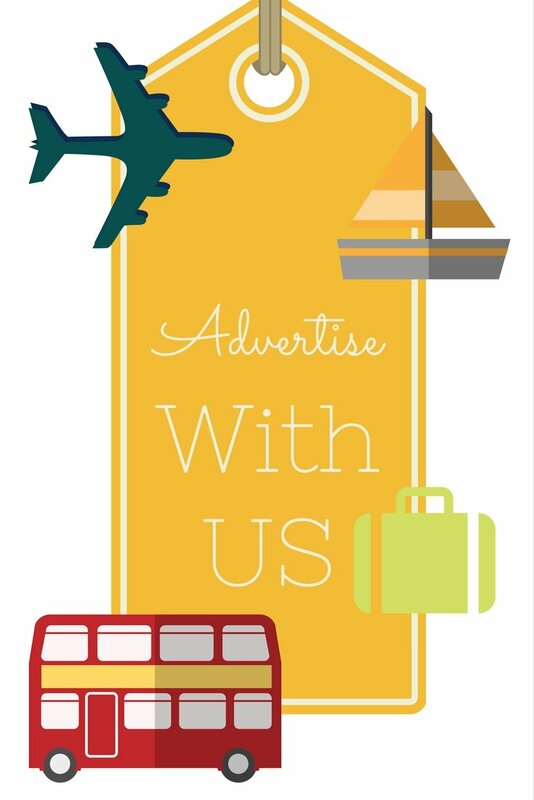 It’s only a few steps from where you get dropped off by your cruise ship transportation.